Got a lot of tomatoes in your garden? Love salsa? Then I’ve got an idea for you! I grew up gardening and canning. We had to when money was tight, but it was fantastic every year in the early fall, late summer because the tomatoes and peppers were ripe. Every year we would harvest and make a huge batch of salsa. None of this salsa made it to canning because it was so good and refreshing on hot days that we would eat it too fast to can. Tomatoes and peppers are so compatible in the garden and on the palate. We would grow mostly bell peppers but also Anaheim green chilies and/or jalapeños. Nothing beats a fresh pepper. My step-daughter loves them. This year she got to take care of her own bell pepper plant and as soon as the peppers were ripe she ate them fresh off the stalks. 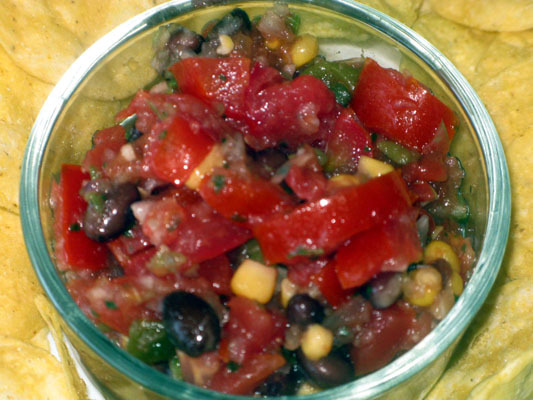 This simple salsa has no real recipe; it is always different and always delicious. As we get more ripe veggies we add them to the bowl until there is no more from the garden and we have devoured it all. So here is my mad method: Get a big bowl with a lid. Dice all the tomatoes you have (you can also boost your tomatoes with a can of petite diced tomatoes) Add to the bowl. I like to mince up my peppers and onion in the food processor so that their flavor spreads evenly through the mixture and no one gets just a chunk of onion. 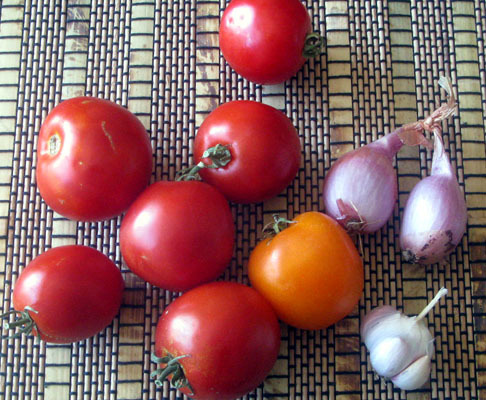 I usually add 1 part onion and pepper to 2-3 parts tomato. Another 1 part fresh or canned green chilies, and 1 small jalapeño or other spicy pepper if you like just a little spice feel free to add more according to your heat preferences. Now spices: a little lime/lemon juice and salt is all that is really necessary but I find that adding a dash of cumin, a clove or two of garlic, and some cilantro make it so much better. I like dry cilantro, it has a very strong smell and flavor when fresh and if you are not fond of it you will not like it in the resulting salsa. I use the dried because it rehydrates in the tomato juice and adds a subtle fresh greeny taste that is not overwhelming. Other options: I like to add corn and black beans to my salsa so when I inevitably eat chips and salsa for lunch there is more protein and bulk in it. I also love the flavor. Now get the chips and enjoy! Like all taste bud adventures this is customizable and only you can make it how you like it. Taste every step and don’t be afraid to experiment with it. I suggest if you want to try adding some different flavors just take a portion of the salsa out and play with it and your spices on a small scale till you find what works for you. Now get those taste-buds working! 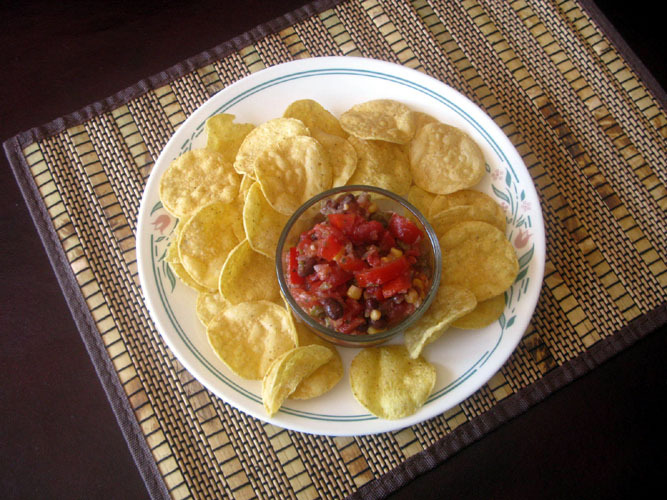 LOVE the customizable salsa recipe. When I grew our salsa garden & made fresh salsa from our garden, everyone was SO impressed with the flavors & wanted the recipe. I had to make it again because I just added ingredients till it tasted right. SO good & healthy! U can do this friends! In addition to beans, HUMMUS is a gr8 way to add protein. Winco has a mix in bulk or you can buy it ready to munch. Yummmmy!